A man walks into the Moonshine Gulch Saloon in bike shorts, and two friends quickly join him. I don’t know how long they’ve been riding, but I know Rochford isn’t near anywhere else so it must have been a while. All three men order a beer, which seems like a strange choice to me. I’m not a fan of beer anyway, but I can’t imagine having one in the middle of a long bike ride. I sit and enjoy my Dr. Pepper as Betsy busies herself around the bar. The bicyclists have all opted to sit out front on the porch, but I think she still feels the need to get back to work now that she’s got more customers than just me. There’s a police scanner on in the background. I hear them say that a woman has been getting calls from a man in Deadwood. He’s claiming she owes him money on a car and is threatening to come down. She’s at the post office waiting to make a report. Time passes and one by one the bicyclists come back inside, each ordering a second beer and returning to the porch. As Betsy gets their drinks I start to examine the wall behind the bar. 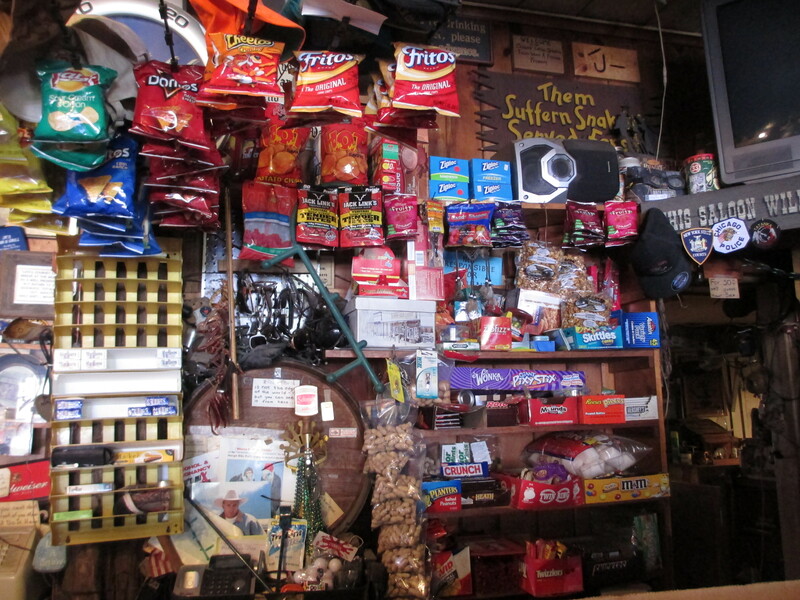 In addition to being a saloon, Moonshine Gulch is something of a general store. At least, a general store for non-perishables. On one side there are tins of spam, bottles of ketchup, cans of fruit cocktail, and just-add-water chow mein. On the other side are snack-sized bags of chips and several rows of candy bars. There are sandwich bags full of in-shell peanuts that were clearly divvied up by Betsy herself. Of course you can also buy boxes of sandwich bags. In addition to the food, the back of the bar is covered in pieces of paper spouting cliches and political opinions, like “Who you hang with in life is who you are,” and “I’ll keep my money, my freedom, and my guns and you can keep the CHANGE.” They’re the kind of thing the old man at the hardware store might repeat to you with a laugh. “We ain’t everybody’s cup of sunshine.” Maybe something you’d read in a chain email from 1998. “It’s not the edge of the world, but you can see it from here.” Nearly every phrase is hand-written, indicating these truisms are spouted nightly by the bar’s patrons. A set of six bikers ride in from Minnesota. The first one walks up to the counter while the others are still removing their gear. He looks at the menu and the beers and decides to get an ice cream sandwich. Betsy walks around the front of the counter to get to the back room, and she emerges holding a single ice cream sandwich. As the first man pays two more enter. They see his sandwich and decide to order the same. Again Betsy walks around the counter to get to the back room, and comes out with two more sandwiches. Just as she’s arrived the last three bikers enter, and all opt for ice cream sandwiches. I am the only one who sees the humor as Betsy goes to the back room for a third time. The bikers join the cyclists outside, and I say my goodbyes to Betsy. She tells me it’s a shame I couldn’t come by on a Sunday afternoon when people gather in town to play music. I tell her about Mountain View in Arkansas, where they play in the park every night. The bicyclists come back in briefly to order another round, and I walk out of the dingy darkness and into the bright South Dakota sun. I turn around to take a picture of the bar, and both sets of riders smile at me. I’d only had a smart phone for two months before I left on my trip. I made the upgrade specifically to help with my travels, and it was a real lifesaver. After three months on the road, I had become confident in, and dependent on, my little iPhone to see me through the toughest times. It told me what to do in a thunderstorm and how long before the current traffic would break up. I could ask Siri where the nearest wifi was when I needed to stop and do some writing. But there are still inhabited places in this country that no cell phone can reach. Case in point: Moonshine Gulch. The recommendation had come from Barb, the friend of the mother of the girlfriend of my Couchsurfing host in Rapid City. She told me the wildflowers near Deerfield Lake were lovely, and that I should visit Moonshine Gulch. In hindsight I probably should have asked for specifics. For example, “What is Moonshine Gulch?” would have been a helpful inquiry. But in my mind I was sure it was a geographic feature, probably part of a state park. I was about 20 minutes out of Hill City when the map on my phone stopped loading. I could still see the little dot representing where I was, but I could no longer zoom and I couldn’t pull up any new directions. 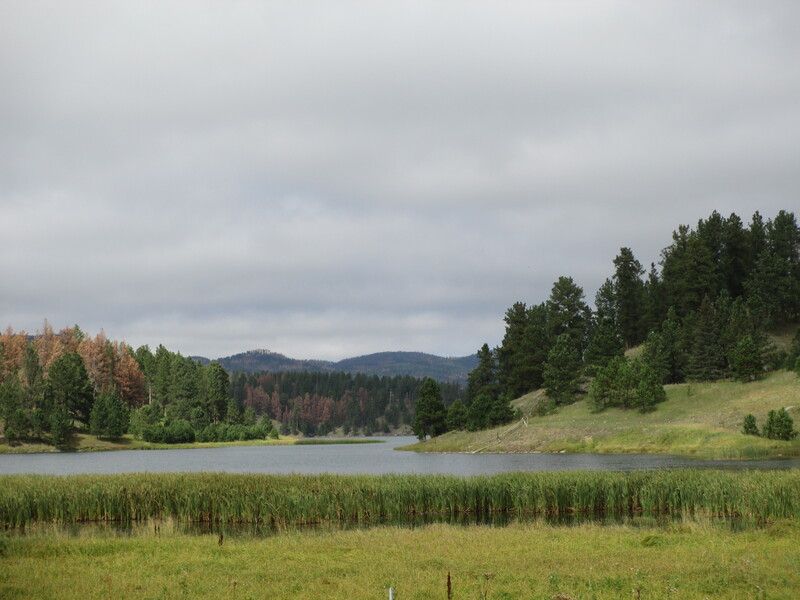 I was smack dab in the center of Black Hills National Forest, and there was no signal. I managed to find Deerfield Lake without much trouble, mostly due to the fact that it sits right on Deerfield Road. After taking in the simple beauty of the lake, I pulled out my computer to look at the Google Maps screenshot I’d taken the day before. The screenshot was only meant to be a reminder of where to go next, not a replacement for real directions. It didn’t include any specific roads and was zoomed out too far to show details. I stared at the map on my computer, then at the roads leading away from the lake. Without directions on the computer or signs on the roads, all I had to go on was angle and proportion. I made a choice and started to drive. I made another choice and continued to follow the shape on the map. I ended up on a dirt road, which is my least favorite place to be when traveling alone. I kept going. A half hour went by before I found pavement again. There were a couple of old houses and a lot of grass. By now I figured I had to be near my destination. I drove slowly past the houses, trying to find a sign that pointed to Moonshine Gulch. I turned the corner and came upon a spot where one road created a T-junction with another. There were about five buildings and it was the closest thing to a town I’d seen in miles. I saw a large sign on one of the buildings for the “Moonshine Gulch Saloon.” I figured I must be close to the gulch if there were businesses named after it. I started driving down one of the roads away from town and found a park. I figured it was the place I was looking for, but a brief exploration proved it was not. I went back towards town and took the only other road out. 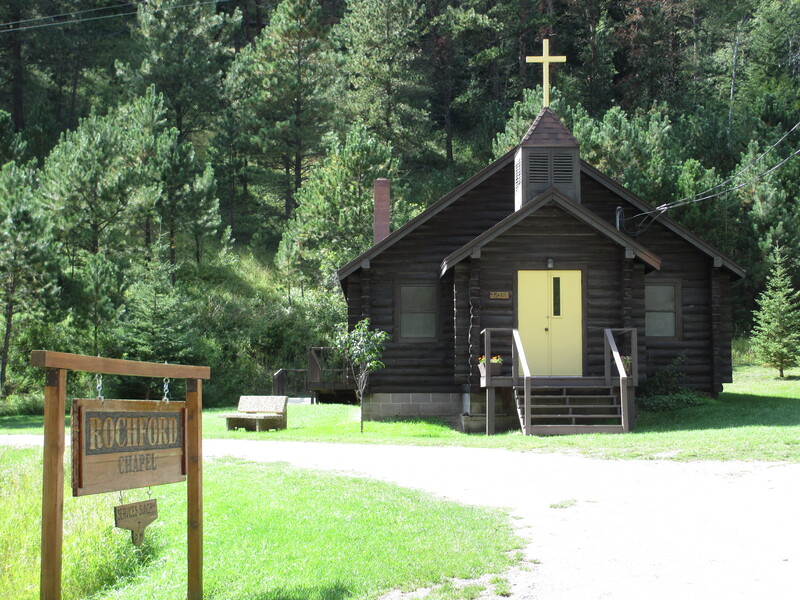 I passed by a chapel and not much else. I turned back. 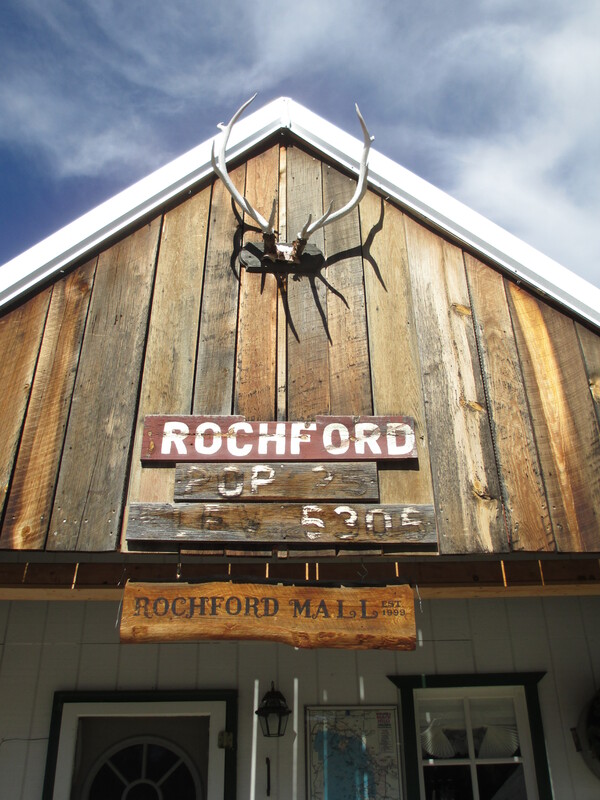 In the center of town there was a small building labeled the Rochford Mall, with the caption “The Small of America” on the side. I parked my car and walked up to it hoping for a friendly store owner, but the shop was closed. There didn’t seem to be anyone or anything around. The chapel sign had referred to Rochford as well, so I knew that’s where I had to be. I turned back to face the saloon again. It had the false front of an old-timey building and a soft drink machine on the porch with an outdated Dr. Pepper logo on it. 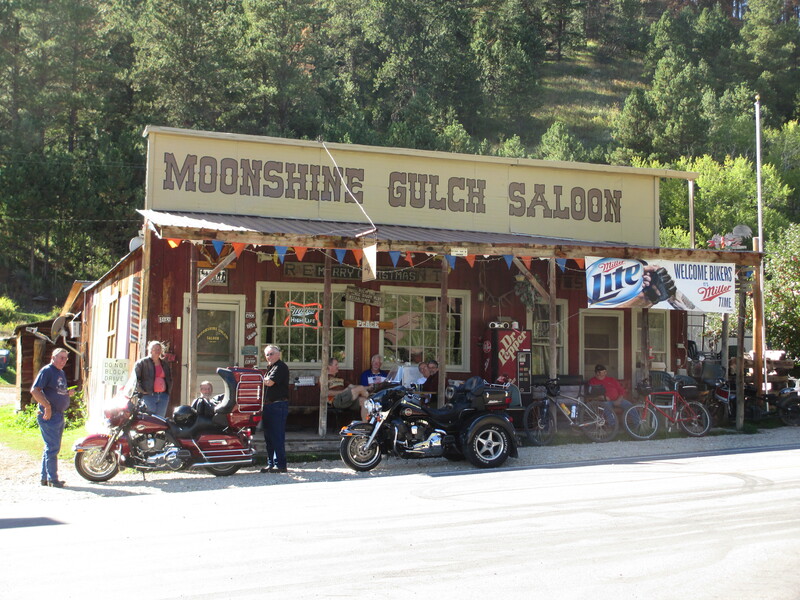 A Miller Lite banner declared “Welcome Bikers.” I read the main sign again in my head: Moonshine Gulch Saloon. This was the place I was looking for.